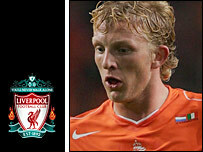 Feyenoord striker Dirk Kuyt is poised to finally decide his future after being linked with a move to Liverpool. Kuyt, 25, has asked for time off to make a final decision on whether to quit the club, and recently revealed Liverpool had made an approach. Holland's £10m-rated World Cup star has also been a target for Newcastle. He told Dutch sports paper AD Sportwereld: "I have an arrangement with coach Erwin Koeman that I can take some days to think about my future." Liverpool's move for Kuyt appears to depend on whether they can clinch a deal for Sevilla's Brazilian right-sided player Daniel Alves. Sevilla are demanding £12m, which would virtually exhaust manager Rafael Benitez's transfer budget. If he pulls out of a move and switches attention to Birmingham City's Jermaine Pennant, he could then have enough cash to fund a move for Kuyt. Kuyt said recently: "The Feyenoord president has informed me of a new approach from last year's European champions. "I am happy at Feyenoord but would like to play in the Premier League." He added: "Last year that was close to happening so for now I prefer to concentrate only on the World Cup because my hopes could be soured again." The Dutchman, who is under contract until 2009, has scored 71 goals in 101 games for Feyenoord but has consistently been priced out of a move by his club. He said: "It is out of my hands. I have several opportunities but it is now down to Feyenoord." The forward began his career at FC Utrecht in 1998 before moving to Feyenoord in 2003.